In any case, these things are fun to collect, and there's always something new to discover. 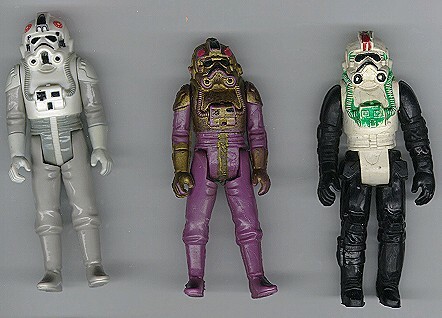 This photo shows, on the right, an articulated rendition of the AT-AT Driver figure from Kenner's Empire Strikes Back line. As you can see, it features the standard Biker Scout limbs. It probably would have come carded, much like the figure you see here. The bootleg figure to its direct left, however, is something different. It is a direct copy (with the correct legs) of the Kenner figure, and is fully articulated. Thanks to information provided by collector Christian Emery, I think we can say this figure is yet another type of Polish figure, one which Christian's contact refers to as the "Deluxe" type. Supposedly, bootleggers in Poland released some articulated figures, complete with accessories, in sealed vinyl bags. These included the AT-AT Driver you see here, Yoda and a Gamorrean Guard. I've had several similar AT-AT Driver figures in my time, all of which were painted differently, so I\'m assuming the colors varied considerably on these things.